We’d love your help. Let us know what’s wrong with this preview of The Serpent's Revenge by Sudha Murty. To ask other readers questions about The Serpent's Revenge, please sign up. For a well versed person like me with the tales of Mahabharata there is nothing new to read in this book. But then this book is not written for the readers like me as well. The Serpent's Revenge is the collection of few unique stories of Mahabharata written in the simple easy to understand language and it will be a great book to introduce your children to Mahabharata. Indeed the book is written with young budding readers in mind. http://thebookworld.org/serpe For a well versed person like me with the tales of Mahabharata there is nothing new to read in this book. But then this book is not written for the readers like me as well. Every time when I read about Indian mythology it gives me new message and it changes my thinking to positive way, I am getting energized by reading about Mahabharata and Ramayana. I am a big fan of the author and reading her from her first book dollar bahu, I know her writing style which is very simple and crispy, easy to understand. So when I came to know about this book I placed the order without any second thought, a book from Sudha Murty on mythology is a good collection for next generation. Every time when I read about Indian mythology it gives me new message and it changes my thinking to positive way, I am getting energized by reading about Mahabharata and Ramayana. I am a big fan of the author and reading her from her first book dollar bahu, I know her writing style which is very simple and crispy, easy to understand. So when I came to know about this book I placed the order without any second thought, a book from Sudha Murty on mythology is a good collection for next generation. Now, the serpent’s revenge is a unique collection of events from Mahabharata, some are known and some are unknown to me. This book will not only help you to narrate bed time stories for your kids but will also add your knowledge about Indian mythology. There are many such stories which you have not heard from your parents or grandparents which are perfectly represented by the author with the help of graphical pictures through the book. Many stories are provided with end notes or rather footnotes, where current location of India and stories behind it is being written by the author, which is best source to know about that particular place and event and why we still worship and importance of that lord. Also last two pages of the book where the family tree of Chandravansh is being provided which is good source of information about Kaurava’s and Pandava’s. I highly recommend this wonderful yet simple representation of Indian mythology for today’s youngsters. This book has little tales from the grand epic Mahabharata. Most of the stories should be known to people familiar with Mahabharata, but that's the thing about Mahabharata, it never gets boring even if you've heard the stories several times. This book is written in a very simple language, and hence so, both children and grownups can enjoy it. It's a nice light read especially if you want to take a break. As usual Sudha Murt's latest book this time on mythology is easy and a quick read. Simple language and the stories that are retold in a manner that one will enjoy reading, despite knowing the story. Interesting read. I didn't know quite a few stories from here. It's a concise and un-animated story telling from a great epic. Simple enough narrative. Having a thought of buying this book for my friend's kid, I gave it some time to read and review first. The book is full of short stories from our Epic Mahabharata and it just reminded me of all the bedtime stories that my grand-parents used to tell me during my childhood. Kids interested in mythology will definitely love this. PS: What I liked the most is that the names of the characters in the Epic are spelled same as in sanskrit unlike cutting short. For instance, in many books Bhima is often Having a thought of buying this book for my friend's kid, I gave it some time to read and review first. Makes good read if you want to connect dots for main Mahabharata epic which most of us know but wonder for no reasons. Makes it good consolidation of short stories for kids also. Most of the stories are known but few of them makes lot of difference in answering why’s of Mahabharata! Interesting stories, but reads like a very oversimplified version. Perhaps that was the intention. This book contains some of the rare stories from Mahabharata.Though the stories are not in very detail, but she was able to depict the essence of the story through her words. I thought I knew Mahabharata to a larger extent. Thanks to my dad who had 5-6 parts of Mahabharata (in his book collections) written by A. Le. Natarajan in simple Thamizh. Sudha Murthy's book is simple in all aspects. The narration, the way of storytelling, relating the locations where the s I thought I knew Mahabharata to a larger extent. Thanks to my dad who had 5-6 parts of Mahabharata (in his book collections) written by A. Le. Natarajan in simple Thamizh. Sudha Murthy's book is simple in all aspects. The narration, the way of storytelling, relating the locations where the stories happened to the current locations in India is making this book a pleasant read. Please pass this book to the young readers at your home as this will help them to face their life in a better and in most matured way. Sudha Murthy with her beautiful easy writing skills has yet again presented these mythical short stories.With no exaggerations and such simplicity she has explained the famous and obscure stories born in and out of Mahabarata. From the stories of ancestors to the decedents the book includes the story starting from Shakuntala's birth and the Somavansha's descendants including Bharatha , Hastin , Kuru clan - Pandavas and Kauravas , Parikshit and Janmajeya . It brings you story of other connecting Sudha Murthy with her beautiful easy writing skills has yet again presented these mythical short stories.With no exaggerations and such simplicity she has explained the famous and obscure stories born in and out of Mahabarata. From the stories of ancestors to the decedents the book includes the story starting from Shakuntala's birth and the Somavansha's descendants including Bharatha , Hastin , Kuru clan - Pandavas and Kauravas , Parikshit and Janmajeya . It brings you story of other connecting incidents also. The Title of the book is the chapter that tells the story of the death of Parikshit as Takshaka takes his vengeance on the Pandava clan for the plight he faced due to Agni burning down the Khandava forest with the help of Krishna and Arjuna ( Pandavas ) . They are different short stories yet has a continuation and the chain ends where it began . A cycle of vengeance. If you are familiar with hearing these tales from you parents or grandparents this will make you so much miss your childhood , as such is her language and narration, so homely! With 25 chapters related to Mahabarata with nothing complex this book is a quick read and refreshing to your mythology knowledge. This one was my first Sudha Murty book and I thoroughly enjoyed it. 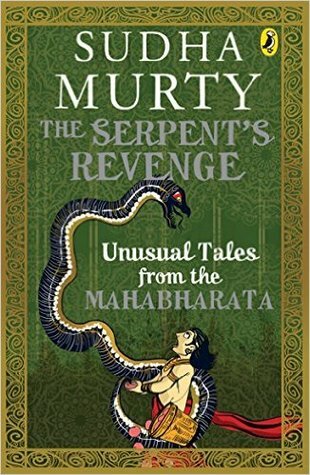 The Serpent's revenge is a collection of short stories from the Epic Mahabharata.I have read the original Ved-vyasa version,but this one is also captivating from the top to end. This book's target audience is children to make them aware of Mahabharata and its popular characters.The related graphics pictures make interest in the stories.And I'm pretty sure that apart from the children,there will be majority Indian people who wouldn This one was my first Sudha Murty book and I thoroughly enjoyed it. This book's target audience is children to make them aware of Mahabharata and its popular characters.The related graphics pictures make interest in the stories.And I'm pretty sure that apart from the children,there will be majority Indian people who wouldn't be knowing some of the tales. Well, the language is very simple and sweet. It is definitely written for kids. But I did enjoy the stories and there were very few of the stories that I hadn't read before. It felt like granny telling you stories. Post every story, the places mentioned in that story during those times are mentioned in the current parts of India which is good enhancing of one's knowledge. There is also a lunar dynasty (Chandravanshis) family tree given at the end. I loved it. Such a unique collection of the lesser known tales from The Mahabharata. The stories were short and sweet and were in the best of chronological order. As usual, Sudha ji's simple storytelling style was a pleasure. I just wish that this book never ended. Fun fact: Looks like my wish might come true, because Sudha Ji has promised that this is only the first book in a series. More to come ! Yayyy! I would say it's a very simple book written in a story-telling mode and I really enjoyed it. Although the stories were not that unusual yet the writing style was captivating. I would not hesitate to say - this book is a perfect writing for the mythology genre. Loved the book. Sudha Murthy has just the right amount of detail in the stories to engross the reader. Hence the stories are short and much more enjoyable to read. Great refresher on Mahabharata and the dots that connect many incidents that unfold in the epic. A lovely reference book and introduction to tales of the Mahabharata for the novice. It is contemporary while retaining the complexity of relationships, stories and morals that encompass the epic. I remember my mother telling me stories about Ramayana and Mahabharatha when I was young after that I was not so keen to know more about it. Since I have read most of Murthy's book i am a very big fan of her books, I ordered two of her other books with which I ordered this too so that I can give this book to my niece(since it's a children's book). Since it is a children's book I knew the stories of Mahabharata how she narrated will be in a easy manner so I started reading this. Although I was no I remember my mother telling me stories about Ramayana and Mahabharatha when I was young after that I was not so keen to know more about it. Thank you Sudha Murthy ma'am for breaking down into short stories which made it easy to understand and making me more eager to know more about Indian Mythology. The book penned by one of my favourite author Sudha Murthy is an analogy of short stories from the epic Mahabharata. The book is a collection of various tales from the epic Mahabharata which are unusual in nature. Unusual is referred to tales of boons, curses and things which we don’t usually see in our everyday lives. The tales are short and fast paced making it intriguing. I completed the book in flat 2 days. Many stories are already known, me being an ardent fan of the epic and some (literally few) tales were not read of anywhere by me. One thing that makes the book interesting is the reference to the places in today’s era where the tales actually took place. The pictorial illustrations in the book gives an insight to the mind about the depiction of the incident. Overall a great book. However, if you’ve already read tales from Mahabharata you can give this book a miss. And it is with this notion, that I picked up the book - to read unusual tales of the times gone by, albeit with a touch of Sudha Murty's Magic of Writing. But, this book felt as if I read the most concise version of Mahabharata which was narrated with the help of short stories to appeal to the readers reading only fiction and lacked her touch. The book is perfect for people venturing into Mythology genre for the first time or haven't read Mahabharata before this, but for others and especially for those who have read Jaya by Devdutt Pattanaik before, you aren't missing out on anything if you skip this book. "No matter what the situation is in the real world, it is reflected in the Mahabharata. If the circumstance is not reflected in the epic, then it will never occur in real life." You will still enjoy t "No matter what the situation is in the real world, it is reflected in the Mahabharata. If the circumstance is not reflected in the epic, then it will never occur in real life." You will still enjoy the stories as the narration is simple and without exaggeration. It will remind you of your childood. This was my first Sudha Murty book and I totally enjoyed it. . I simply loved this book! Sudha Murty has beautifully rendered some of the unusual tales (as the title suggests) from the Saga. I was amazed by the family tree of the whole clan at the end of the book. So thorough! What I liked most about this book is that there are many lesser known characters and their barely known tales. It's like a re-introduction to all these characters! And every character teaches you something. That is the beauty of this epic tale. It covers so many different situations, pr I simply loved this book! Sudha Murty has beautifully rendered some of the unusual tales (as the title suggests) from the Saga. I was amazed by the family tree of the whole clan at the end of the book. So thorough! And every character teaches you something. That is the beauty of this epic tale. It covers so many different situations, problems and what not. Even though this Book is collection of short stories from Mahabharata, it will put the reader into a unexplained urge to go and explore the Epic further. Sudha Murthy has narrated these stories in such simple yet profounding words that even a novice reader would want to go and devour this classic in more depths. I am now craving to read Jaya and The Palace of Illusions which have Even though this Book is collection of short stories from Mahabharata, it will put the reader into a unexplained urge to go and explore the Epic further. I am now craving to read Jaya and The Palace of Illusions which have been lying on Book shelf for sometime now. Utterly pedestrian retelling of familiar stories from the Mahabharath with MAYBE one or two exceptions. Even the story-telling is nothing new. A reconsidering of motives, possible historical context, explanation of cultural changes, nothing is even mentioned to warrant a retelling of these tales. The only thing of interest was the effort made as a postscript to each story to ground it in geographic reality. The only problem with positing that these stories have a real location is the risk of allo Utterly pedestrian retelling of familiar stories from the Mahabharath with MAYBE one or two exceptions. Even the story-telling is nothing new. A reconsidering of motives, possible historical context, explanation of cultural changes, nothing is even mentioned to warrant a retelling of these tales. It teaches lessons of life to you. How to tackle problems in your life , how to choose correct path , how to become good humane being by following dharma, What is dharma? It clears all concepts of dharma. Every character in this book and mahabharta is well described with all its strengths and weaknesses. Each character teaches you something which you can relate to your real life situations. The stories are written brilliantly and explained clearly. The narrative used keeps you interested and binds you to the book. However, I had read about Mahabharata from various sources as it is my all time favorite epic, so I knew 90% of the stories mentioned in the book so in terms of stories it was not something new to me but I loved the fact that such unknown stories being written by such an amazing writer. “Suddenly Yudhisthira saw a yaksha approaching him. The being sat in front of him and began firing questions rapidly at him. What is bigger than the Earth? the yaksha asked. What is taller than the sky? What is faster than the wind? "The mind , of course". Yudhisthira smiled. What grows faster than hay? With who is friendship never-ending? "With good people" responded Yudhisthira patiently. What is the secret to never feeling unhappy? "If one can control his or her mind, then that person will never feel sad"
The yaksha increase his pace now. What is the greatest kind of wealth. What is the greatest kind of profit? What is the greatest kind of happiness? "Contentment" said Yudhisthira, ever prompt with his replies. What is man's worst enemy? What disease will never have a cure? The yaksha smiled again. A last question my friend. What is life's biggest irony?